Colorful Cross Strap wedges from SammyDress! Ever since I've started wearing heels, I've always have had a special fancy towards wedges! Recently I realized that I've considerably neglected buying new wedges which was a big blunder on my part!! As a result, got hold of this beautiful pair from SammyDress. Although SammyDress has an enormous collection of women's wedges, lots and lots of lovely pairs to choose from, however as soon as I saw this one, just knew it had to be this! Although the base color is beige, it has a number of colorful stripes on the wedge heel that makes it more versatile. It has a cross strap design with a cute hanging star buckle. The best thing about wedges that I like is how wonderfully they go along well with both western & Indian dresses! 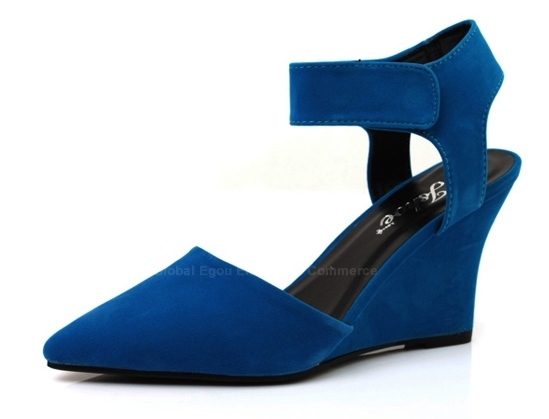 Unfortunately these wedges are out of stock at the moment, hope they are re added soon. Here are a few more favorite wedges from SammyDress....which one do you prefer the most? Don't forget to share your views on my latest pick,with me!